Nero's love for oysters was well documented. He was supposedly so proficient in his tasting ability that he could tell where an oyster originated by its taste alone. The Romans were the first to transplant oyster seed. The first oyster farmer in recorded history was a Roman named Sergius Orata. He saw it as an opportunity for great wealth. The Romans used oysters and their ground shells for medicinal purposes. And yes, they consumed hundreds of oysters at huge feasts. Nero apparently has had a bum rap about the burning of Rome. There is evidence that he was out of town at the time. The story about the violin playing is also bogus. The violin was not invented yet. Think about it. Mozart was centuries away. Whose music would Nero play? 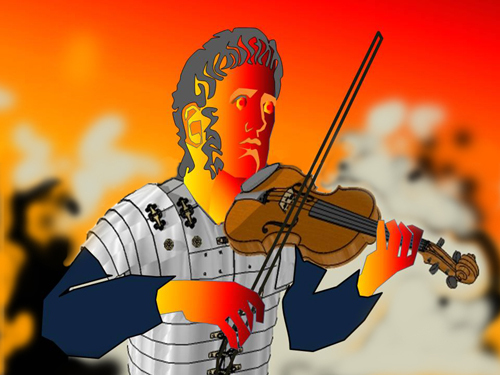 It is thought that Nero might actually have been proficient on the lyre, a primitive precurser for the violin. Before you get all soft and cuddly about Nero, remember that he was pretty brutal and possibly played a role in killing his own mother. I doubt that he shucked his own oysters.